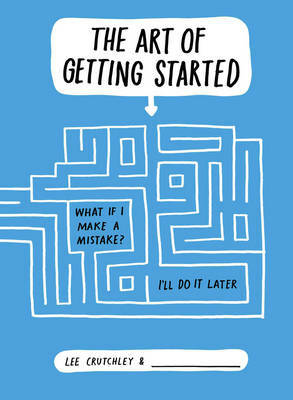 The ideal companion for all creative minds - The Art of Getting Startedis the long missing piece of the creative puzzle. As a self-professed procrastinator, illustrator Lee Crutchley knows the 'first blank page' all too well and has used his expertise to devise a unique variety of impulsive habits to kick start the brain. Through a series of hand-written tasks and challenges Lee leads the reader through a range of lively prompts to shift the perspective and get those creative juices flowing again in new and surprising ways. Quick fire questions encourage impulsive decisions, tapping instantly into creative instincts, learning the best way to engage the mind into getting that all important start. Be prepared to write, draw, cook and explore as this stimulating, witty and hands-on guide takes readers to inspirational heights and as a capable right-hand-man, it will be tough to be without it. Taking 'back to basics' to a new level, Crutchley wants readers to immerse themselves, creativity in its purest form. In answer to the procrastination nation is a new technique, and creative method: The Art of Getting Started.